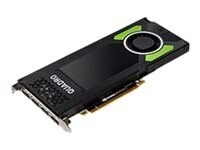 The NVIDIA Quadro P4000 combines Pascal GPU, large memory and advanced display technologies to deliver the performance and features that are required by demanding professional applications. The ability to create an expansive visual workspace with HDR color support lets you view your creations in stunning detail. The P4000 is specially designed with the performance that is necessary to drive immersive VR environments.